MERE paas Ma hai. The famous tagline in Deewar has epitomised motherhood in all its colours and substance. It also immortalised the woman playing this mother, namely Nirupa Roy. Nirupa Roy, who passed away recently, was born as Kokila Kishorechandra. She first played the role of a mother in the Dev Anand-starrer Munimji. Damini Kapoor Chintamani, a finance management graduate from Mumbai University, quit a high-income banking job to clinch a Rs 100-crore-for-125-paintings deal between industrialist Mehar Srivastava, son of Kolkata-based business-tycoon Guru Swarup Srivastava, and artist M.F. Husain, making a neat commission. MERE paas Ma hai. The famous tagline in Deewar has epitomised motherhood in all its colours and substance. It also immortalised the woman playing this mother, namely Nirupa Roy. Nirupa Roy, who passed away recently, was born as Kokila Kishorechandra. She first played the role of a mother in the Dev Anand-starrer Munimji. 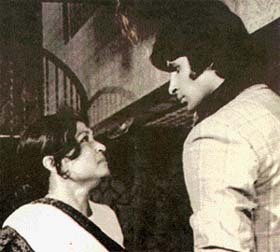 However, teaming up with superstar Amitabh Bachchan made her the most remembered screen mother in Indian cinema. She began her film career in a Gujarati film Ranak Devi in 1946. She had just accompanied her husband who had applied for a role in the film. He was rejected but Nirupa was told they would take her on as the heroine of the film. Her husband agreed. on the spot. Being from an orthodox family of Bulsar, Gujarat, she was ostracised for joining films but she decided to stick to her husband's wish. Nirupa's first film Gunsundari was a hit. Her success changed the attitude of those who had isolated her. She forgave them as it was their opposition that had made her rebellious and of course famous. Har Har Mahadev was Nirupa's first Hindi film. It was a success and led her on to do 40 mythological films. Thus, in the 1950s, she played all the devis known. Snakes were her main co-stars in the mythologicals— the others being Mahipal and Trilok Kapoor. When Nirupa acted in some stunt films like Sindbad the Sailor, Chaalbaaz and Baazigar, the public response was almost violent. They objected to a devi doing stunts. Their attitude to her was reverential. Do Bigha Zameen, released in 1953, was the most important of her social films. Nirupa had been so used to wearing a load of jewellery, heavy make-up and the finest costumes for her many mythological movies, that she felt lost on the first day of Do Bigha Zameen — they gave her a mere touch of make-up. She quietly applied an extra coat on her own to gain confidence in the new surroundings. But one look at her painted face and director Bimal Roy ordered her to wash off all that stuff. She and co-star Balraj Sahni wore tattered clothes. Bimal Roy deliberately got the clothes soiled. Nirupa worked with Ashok Kumar and Balraj Sahni in 15 films each and shared a great rapport with them. Kaid Mein Hai Bulbul, Karigar, Grahasti, Gumrah to name a few with Ashok Kumar made them a hit pair. Once for a shot for Heera Moti, Balraj had to hold her arm and push her out mouthing a lengthy dialogue. The scene began, he held her arm and the glass bangles she had on broke and cut a vein. When blood oozed out, Balraj was giving such a wonderful shot that she didn't utter a word. After the director said `cut' and the actor saw what he'd done, he was very upset and chided her for not stopping him. The scar she carried on her arm was a witness to her dedication to the profession. In the 1960s, Nirupa did several historicals like Amarsingh Rathod, Rani Roopmati, Samrat Chandragupta, Maharana Pratap and Kavi Kalidas. Her co-star in these generally was Jairaj. The switch over to character roles happened by a quirk of fate. 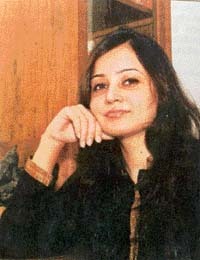 Nirupa was signed to play the heroine in Munimji. But later the story was changed and a young heroine was taken on. As a result the portions in which Nirupa was young were eliminated. Some scenes came as a flashback and those where she was old remained. She won the Filmfare Award for the Best Supporting Actress for her role. After that nobody approached her to play the singing and dancing heroine. She was forced to play mature heroine roles. For the climax in Deewar, Amitabh Bachchan's death scene, the director insisted on the sequence being done in one shot. Nirupa just had to hold him. One mistake on her part could have spoiled it all. Nirupa was crying and didn't stop till five minutes after the director had called `cut'. Somebody put a hand on her shoulder and said that the shot was over. The Deewar role was a character role with a difference, yet several top heroines in retirement like Waheeda Rehman, Nanda, Asha Parekh and even Vyjayanthimala had refused to accept it. Nirupa was thus the last choice. She couldn't have been more grateful. The role won her immense appreciation. Out of 450 films in her career spanning five decades, she won Filmfare awards for Best Supporting Actress three times— for Munimji (1955), Chhaya (1961) and Shehnai( 1964) . Earlier this year, she won Filmfare's Lifetime Achievement Award along with the other screen mother Sulochana. Nirupa’s cup of joy couldn't have been fuller. For a lady who hadn't seen a film till she got married, it was indeed a beautiful finale. Damini Kapoor Chintamani, a finance management graduate from Mumbai University, quit a high-income banking job to clinch a Rs 100-crore-for-125-paintings deal between industrialist Mehar Srivastava, son of Kolkata-based business-tycoon Guru Swarup Srivastava, and artist M.F. Husain, making a neat commission. At 26, dynamic Damini Kapoor Chintamani, a finance management, graduate of Mumbai’s N.M. Institute of Management has proved that absolutely novel concepts in making big money often succeed in a spectacular manner. Unknown to the public at large, Damini has successfully brokered the biggest-ever deal in contemporary Indian art selling in August 2004. Damini is a typical modern career woman, dressed in trousers and shirt. But behind her prim and proper working-woman personality, lies a brain, which thinks of radical concepts of wealth creation in mind-boggling ways. Damini, emboldened by her hunch, contacted Mehar Srivastava, son of Kolkata industrialist Guru Swarup Srivastava, a rich businessman with interests in shipping, exports and construction. Mehar conducted his own research at the behest of Damini and came independently to the same conclusion. "His decisions were quick and firm," says Damini, "He bought the work of well-known artists like Jehangir Sabavala and others. Soon, by another co-incidence, we both saw an article on M.F. Husain’s art exhibition in Dubai. I contacted Husain saab’s son Owais and a meeting was arranged between Mehar and Husain in Delhi. Later, Owais, Mehar, Husainsaab and I met in Mumbai. In that meeting, the biggest deal in the contemporary art business of today was outlined. I worked out the fine details with Owais and the deal was through. Husain saab had 25 paintings ready — among them was one of Gandhiji and one of Charlie Chaplin. These were sent to Mehar’s house. The remaining paintings will be completed within the stipulated time and given to the Srivastava family for a payment of Rs 100 crore.The total number of paintings is 125. The art world is extremely excited about this deal because this means that Indian contemporary art will see much better days internationally. Art buyers all over the world will look at Indian artists as bankable people and a new era in Indian art may well begin with 2004." Adventure has paid off. Damini is unwilling to reveal the whopping amount of commission she has earned in selling 125 paintings of M.F. Husain. But there is no denying that she would have earned enough to become a serious art buyer herself.